It's ugly as hell but the SP1 offers clear, balanced audio - albeit audio that's a little soft in the bass department. It's good for studios or bedrooms, but rivals are just as capable and often much better looking. Portable speakers fill a very specific gap in the audio market. You want portable music that you can share, so headphones won't do, and you want personal audio in a small room, like a study or bedroom, but your budget won't stretch to something bigger, and arguably better. Antec's SP1 certainly isn't alone in this space, with the Jambox, Jabra Solemate and Logitech Mini Boombox, to name a few, all about the same size, and offering the same level of sound. Compared to these other speakers, the SP1 is a little on the boring side aesthetically. 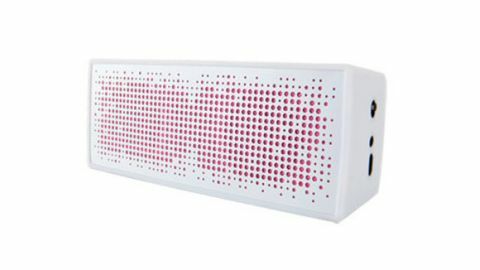 Our review unit is in white with hints of red showing through the speaker grill, and though it is lightweight, it feels cheap and looks like it was designed by an product engineer rather than a thoughtful designer. In regards to the position of key features, like volume controls and power inputs, the SP1 mirrors its competition; with three buttons on the top of the unit and power down the right hand side. Identifying the power state of the unit is a matter of watching blinking white and red LEDs beneath the power switch. This is a bit tricky at first, with the flashing indicators for low power and pairing mode being basically the same, but it doesn't take long to get up to speed. There is also a 3.5mm auxiliary input socket for connecting to devices over a wired connection. For all other connections, the SP1 relies on Bluetooth for pairing with mobile music players, like smartphones. This is a smart play by Antec as it doesn't single out one group of players or another. Basically all new phones, tablets and media players support Bluetooth pairing and media streaming. Bluetooth also gives you the freedom to kick back on the sofa and control your music remotely. The SP1 unit is powered by an internal rechargable battery, which Antec estimates is good for 10-hours of playback. It is important to remember, that there are always limitations to the sound you can produce out of a device this small and compact. It is difficult to get a balanced sound out of these portable units, and most of the manufacturers lean heavily on the bass for a more impressive sound. The SP1 goes in the other direction. The bass is noticeably lacking in the mix, but the result is a cleaner, clearer sound than we expected. Vocals sound good, and guitar driven songs show off some of the instrument's subtler elements. This isn't the speaker you can run a dance party off, but it wouldn't be bad to study with. As it is with most portable speakers, the sound out of the SP1s is highly unidirectional. This means that, while you can hear the speakers from anywhere in a room, you will only get the best of them when sitting directly in front of the unit. If you can position them at head height, all the better. What the SP1 lacks in design, it makes up for in clear, balanced audio, that is penalised only for its soft hand on the bass. A good unit for the bedroom or studio apartment, but you may want to listen to the Logitech Mini Boombox before you make a decision.